Dominoes Information: You can learn about the history of dominoes and the basics of gameplay, find domino clubs, organizations, and tournaments, links to other domino sites, and find out where to purchase dominoes and domino accessories. Domino Rules: Domino-Games.com provides the rules for all of the most popular domino games, as well as many lesser-known games. In addition, Domino-Games.com provides, for each of these games, links to other domino rules on the web, so that you'll be assured of the most authorative and complete set of domino rules on the net. Domino Software: Domino-Games.com aims to provide the most comprehensive directory of domino games available -- freeware, shareware, and commercial -- for all popular operating systems, including Windows, Macintosh, PocketPC, and PalmOS. 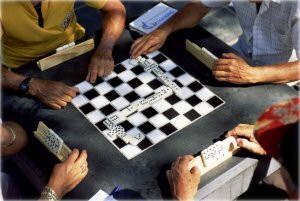 Online Dominoes: Domino-Games.com provides a directory of online domino games. This includes simple you-against-the-computer games, one-on-one games against real people, and online domino tournaments. Buy Dominoes: Domino-Games.com offers one of the largest and most comprehensive selection of domino products available anywhere, including dominoes, domino accessories, and retail domino games. Dominoes News: Catch up on the latest news in the world of dominoes. You probably played dominoes as a child, and most likely have a box of the little rectangular tiles hidden away somewhere in a closet or a drawer somewhere, ready for a rainy day or a lazy Sunday afternoon. But if you think dominoes are only for kids, you're wrong. Like playing cards and dice, dominoes are very simple and basic gaming devices. But the games that you can play with dominoes are limited only by your imagination. There is a huge variety of domino games, ranging from simple to complex, from easy to difficult. Dominoes are believed to have originated in China (see Domino History) in the 12th century, made their way to Europe in the 18th century, and are today popular around the world. They are played by all ages, all races, and all nationalities. Dominoes is considered to be the national game of many Latin American countries, and is a popular club game in Europe, and a hot party game in the United States. If you're new to domino games, or just need a brush-up on the basics of domino gameplay, check out our Domino Basics - Getting Started With Dominoes page, which will help you learn about the dominoes themselves, as well as the fundamental knowledge and skills that are common to nearly all domino games. Once you know the basics, you can start with simple games such as Block Dominoes or Draw Dominoes, and perhaps move on to interesting games like Chickenfoot and Matador. The always-popular Five-Up and Muggins are a good introductions to point games, and Forty-Two, the "National Game of Texas", is a great domino game that plays much like a card game. Mexican Train is a game that has taken North America by storm, proving to be a very popular party game, with its own themed dominoes, domino hubs, timers, and other accessories. Regulars gather Monday through Saturday to play intense games of dominoes and rummy at Tampa's Centro's Cantina, where they chatter about life and politics, share a drink, sip Cuban coffee, smoke a cigar and reconnect to a social scene no longer commonplace in Tampa.